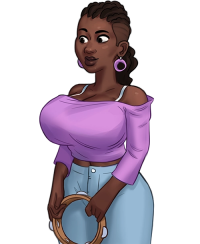 Ms. Dewitt is an extremely well‐endowed and curvaceous African American woman, with corn row brown hair and brown eyes. She wears a purple off‐the‐shoulder top revealing her white bra, and a pair of jeans. Her accessories are her matching purple earrings. When in her classroom, she commonly carries a tambourine. She has a very laid back personality and doesn't mind looking past minor rule infractions for the musically talented students. Ms. Melody Dewitt is the music teacher at the main character's high school. When he returns to school, she supports him to get his groove back. She worries about her annual talent show, since Principal Smith is using all means to sabotage it. See Ms. Dewitt's route for the complete walkthrough. Beer and a teacher in underwear are the ingredients for a successful party. Stay focused on the closing speech, while Ms. Dewitt is taking care of him at the same time, is a hard thing for the main character. When it comes to playing with four hands, the music teacher is in charge of the show.